▲$188.1 billion, based on information from Forbes, February 2008. 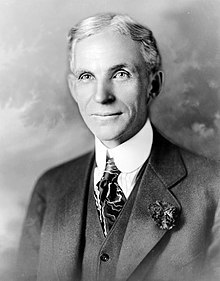 Hi Henry Ford (Hulyo 30, 1863 - Abril 7, 1947) amo an usa ka amerikano nga inhenyero ngan negosyante. Nagtikang hiya paghimo hin sarakyan ha 1896 ngan gintukod niya an Ford Motor Company. An iya asawa amo hi Clara Bryant ngan mayda nira anak nga ginngaranan nga Edsel Bryant Ford. Bennett, Harry; with Marcus, Paul (1951). We Never Called Him Henry. New York: Fawcett Publications. Sorensen, Charles E.; with Williamson, Samuel T. (1956), My Forty Years with Ford, New York, New York, USA: Norton, LCCN 56010854. Various republications, including ISBN 9780814332795. Daniel M. G. Raff and Lawrence H. Summers (October 1987). "Did Henry Ford Pay Efficiency Wages?". Journal of Labor Economics 5 (4): S57–S86. doi:10.1086/298165. Pietrykowski, Bruce. (1995). "Fordism at Ford: Spatial Decentralization and Labor Segmentation at the Ford Motor Company, 1920–1950". Economic Geography 71 (4): 383–401. JSTOR 144424. doi:10.2307/144424. Pool, James; Pool, Suzanne (1978), ""Chapter: Ford and Hitler"", Who Financed Hitler: The Secret Funding of Hitler's Rise to Power, 1919-1933, Dial Press, ISBN 978-0708817568, http://books.google.com/books?id=1wBoAAAAMAAJ. Foust, James C. (1997). "Mass-produced Reform: Henry Ford's Dearborn Independent". American Journalism 14 (3–4): 411–424. doi:10.1080/08821127.1997.10731933. Sapiro, Aaron L. (1982). "A Retrospective View of the Aaron Sapiro-Henry Ford Case". Western States Jewish Historical Quarterly 15 (1): 79–84. Silverstein, K. (2000). "Ford and the Führer". The Nation 270 (3): 11–16. Woeste, Victoria Saker. (2004). "Insecure Equality: Louis Marshall, Henry Ford, and the Problem of Defamatory Antisemitism, 1920–1929". Journal of American History 91 (3): 877–905. JSTOR 3662859. doi:10.2307/3662859. Ini nga pakli kataposan nga ginliwat dida han 14:06, 30 Enero 2015.